San Diego Taco Shop Secret Gems: Explore the Amazing World of Mexican Food. Skip the tourist food. Are you ready for an authentic San Diego taco shop, one that local Hispanics hit when it’s time to chill with the family? Discover why a taco truck lunch is quite a thing to experience in San Diego. Here are a few that are not to be missed. Tacos El Gordowas is a great one for their pork adobada tacos, a mouth watering feast at only $1.75 each. If you love a spicy shrimp taco, Marisco’s German Taco Truck 3 has some of the hottest and tastiest in City Heights. If you’re looking for more than just a casual burrito joint, try Cantina Mayahuel in Normal Heights, a little more expensive but the food is high quality and the tequila can practically be lit on fire. Mondays feature $5 margaritas and $6 three taco specials. For more experimental flare, check out Puesto in La Jolla, where you can get an eclectic selection of grilled items and toppings that will blow away your understanding of what a taco can be. Some of the wilder possibilities include Huitlacoche (corn truffle) with grilled pineapple, and Jamaica salsa. As a full scale, sit down restaurant that’s beyond your typical San Diego taco shop, Casa Adams is known in the neighborhood for their chile colorado, a chili dish made with dried red chiles and meat spicy enough to bite you back but juicier than the Rio Grande. Another taco joint to die for is Las Cuatro Milpas located in Barrio Logan. All tacos are made onsite, so they are unbelievably fresh. In Mission Hills, there’s Lucha Libre, which had the honor of appearing on Man vs. Food in 2010. Make sure you try the Flaco Taco where the marinated chicken wrapped in a lettuce tortilla is absolutely to die for. Karina’s Taco Shop in Leucadia serves up some of the best fish tacos in the city. The carne asada loaded with guacamole is a must. Located so close to Mexico, San Diego has plenty of great places to get a taco, so it’s hard to narrow it all down. Look for long lines, and you are probably in the right place. What tacos do we recommend in San Diego? 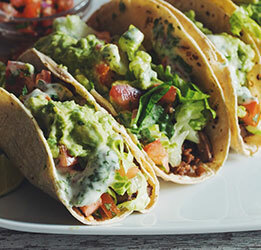 Try the Voodoo Taco, which has some amazing fish tacos garnished with a sweet and tangy papaya salsa on the crispiest, spiciest taco shell in the world. The the pork adobada taco at Cantina Mayahuel in North Park are just to die for. And the tequilas are a great way to wash down a taco. For chicken and pork tacos, the best place has to be Las Cuatro Milpas. They make their own tortillas and serve them up with crema, queso fresco. The tortillas are fried in lard. Absolutely delicious. Get them for lunch or early afternoon, before they close at 2:30. Yes, we will be the first to admit that sometimes there’s a competition as to who serves the better Mexican style food in Southern California. We truly love Los Angeles taco trucks, as much the San Diego taco scene. Although we would love to point out that one staple ingredient in the SD taco food scene: french fries! If you love nachos, you’ll love “Carne Asada Fries” which is literally a substitute of fries vs the usual nacho chips, loaded with all the amazing toppings on top. In the mood for a burrito instead? Only in San Diego, the “California Burrito” famously stuffed with french fries is a local favorite! One of my favorite Los Angeles Chinese restaurants to get Peking duck hands down is the Duck House on Atlantic Boulevard in Monterey Park. They separate the hide from the moist meat of the duck, which you wrap in a delicious pancake garnished with a green onion, cucumber, and a plum sauce. The duck is some of the tenderest you can get in Chinatown. Word has gotten out, so there’s usually a line, but it’s well worth the wait. Late afternoon is usually the best time to go. Duck this succulent must be experienced to be believed. Bring a friend. It’s quite meal and you might need some help.